When users want to switch back: "Build a Business Case." Thanks to a colleague for this. Here's the scenario. You've adopted an OpenOffice.org. You're saving hundreds of thousands of dollars. Or thousands. Or millions. It's a lot. And OpenOffice.org is working. It's allowing your users to get their work done. You've done your pilot and testing and worked through the initial issues with getting everyone up and running, and you're satisfied that it works. But you have someone, possibly hundreds of someones, telling you that they absolutely need Microsoft Office for various reasons. Don't just say no. Consider this approach. Ask them to contrast the amount of time they would save, or whatever the benefit is of getting MS Office, against the amount of money saved per person per year, of using OpenOffice.org. This is particularly effective with people who claim (sometimes accurately, often inaccurately) that MS Office is quicker. 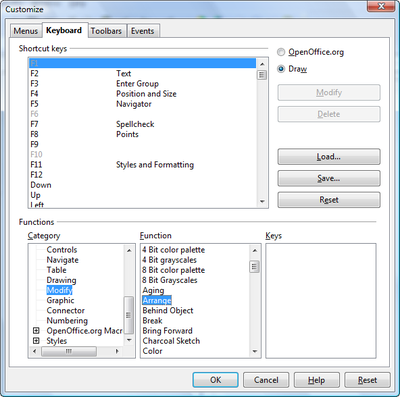 That five clicks are necessary in OOO but two clicks in OpenOffice.org. This approach, if they actually follow through, points out to them and to anyone with authority over decisions and writing checks that there really isn't much impact. 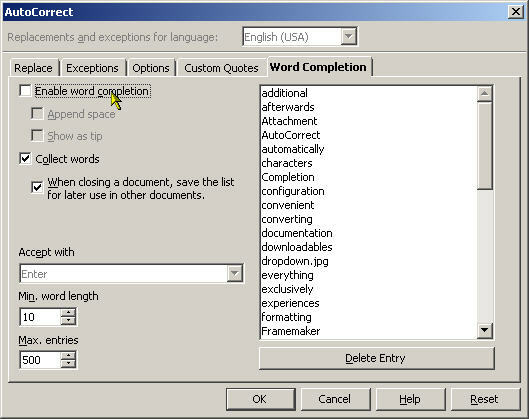 It might feel better, and sometimes at least at first be a little more convenient for some procedures for some users to use Word. But is preference enough? Not when you look at the big picture and the business case. And of course by saying "sure, we'll listen to your request, just do a business case," you get to be the good guy and the ball is back in their court. Now, if they do have a business case for getting, for themselves and maybe three other people in the company, a few copies of Excel or whatever, then sure, get it for them. It's all about having the right tools and spending your money on what makes sense. I wrote this article for my friend Russell over at FanaticAttack. Lots of comments (I clearly need to do better at publicizing my own blog! ;> ). Check it out; it's definitely one of my more explicit, step-by-step guides. 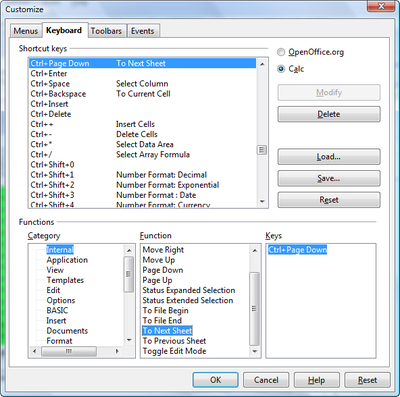 Here are some setup tips to help you get OpenOffice.org humming. 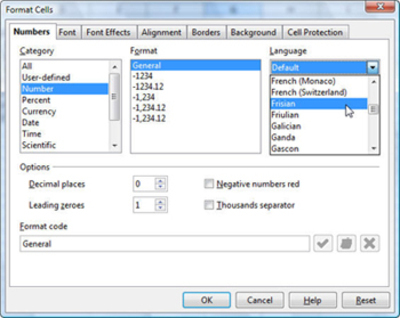 Some of the default settings aren’t quite what I would recommend, but it’s very easy to make the changes. First, choose Tools > AutoCorrect. 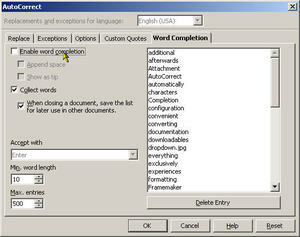 In the Word Completion tab, turn off word completion if it bugs you by unmarking the Enable Word Completion option. If you like it but want to change what key you use to accept the suggestion, you can do that too. A window you want to get to know: choose Tools > Options. 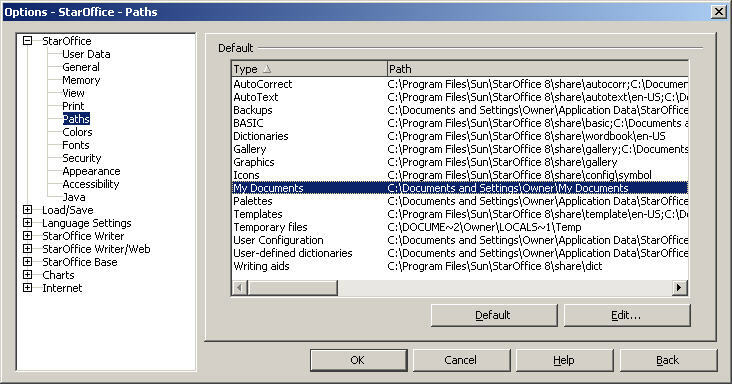 I strongly recommend that you go through every option in that window since many are very useful. 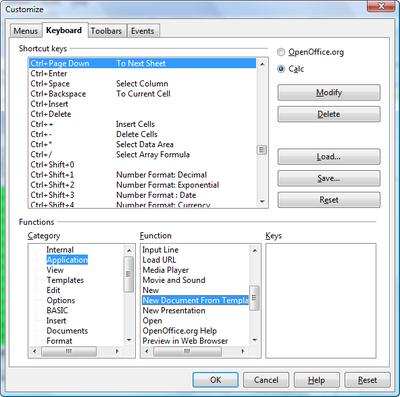 To get the options for text documents you need to have a Writer document open first; to get the options for spreadsheets you need a Calc document open first, and so on. 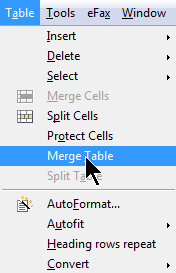 I like to choose Tools > Options > OpenOffice.org > View. 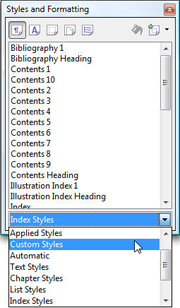 Select Large as the icon size. You might also want to turn on backups. 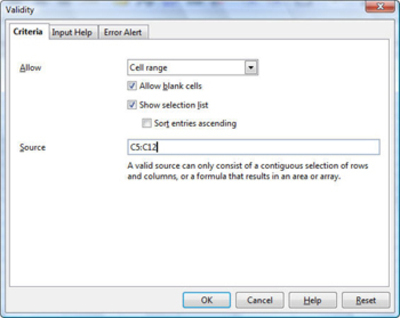 Choose Tools > Options > Load/Save > General and select Always Create Backup Copy. 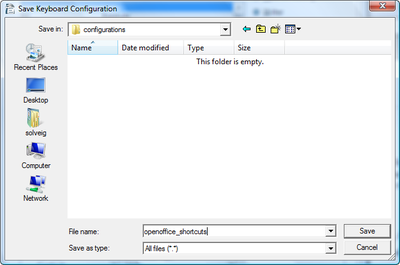 The backups are created at the location specified for backups under Tools > Options > OpenOffice.org > Paths. 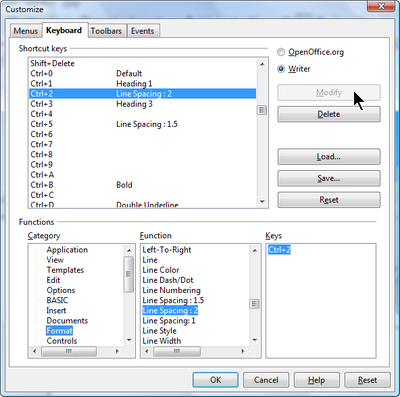 If you find the color selection in OpenOffice.org lacking, you can create your own under Tools > Options > OpenOffice.org > Colors. 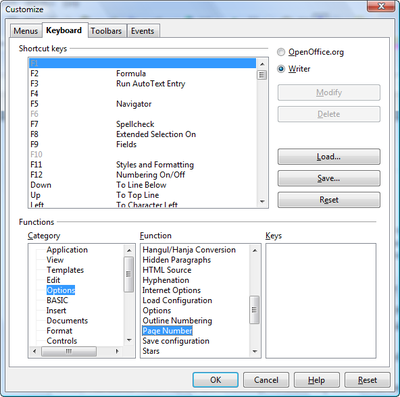 Writer printing: Tools > Options > OpenOffice.org Writer, Print: you might want to turn off the option for printing automatically inserted blank pages unless you’re heavy into the first page of a new section starting on the right-hand page. 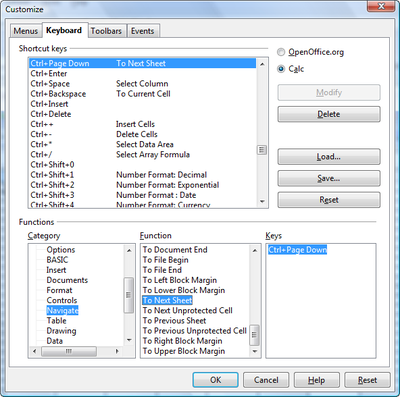 Calc printing: Tools > Options > OpenOffice.org Calc, Print: it’s best to turn off both options here. 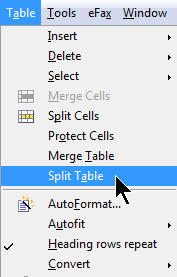 If you want to select two or more sheets to print when you’re ready to print, just select one sheet tab, then hold down Ctrl and click on each additional sheet you want to print. 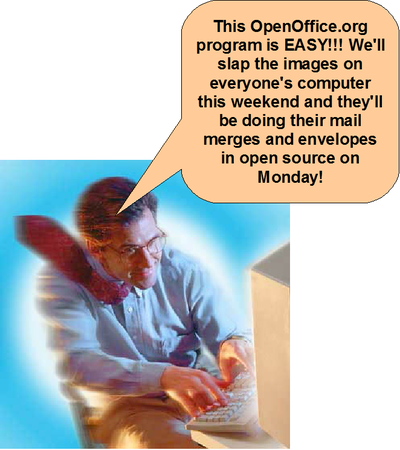 When you switch a group of people to OpenOffice.org, the biggest problems you encounter are rarely about the software. It's all about change management. I've been trying to untangle this problem for years, and I have a few techniques. Show people the fun, cool aspects of the program. Emphasize the money being saved (which usually doesn't help at all). 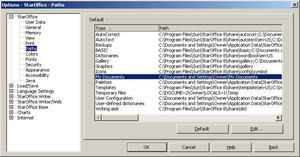 Try to demo the program without divulging that it is not MS Office. And then NPR comes along with two back-to-back stories that are directly relevant. I'm sitting here with my tea listening to a story about loss aversion, how we will work harder to avoid losing something we want than to gain the same thing. (Kind of like how we feel the pain of losing money on the stock market more than we feel the pleasure of gaining.) I thought, wow, this is so applicable to the psychology of switching to OOo. So I started creating a new blog entry and bam, the next story is about how people get more benefit from a placebo when they are told it costs more. And that, obviously, is dead-on applicable to switching to OOo as well. I could hardly type fast enough. Here's the first story. There's a site, www.stickk.com, where you can place a bet on whether you will lose a certain amount of weight by a certain date. (Let's leave aside the question of verification.) According to the NPR story, some people respond very well to a contract. 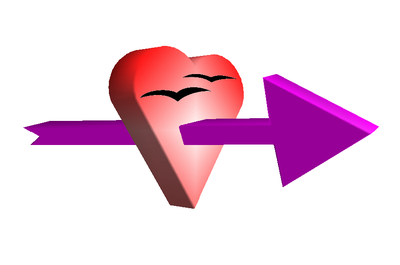 ""There are a significant portion of people who have an explicit preference for commitment," says Karlan. The commitment, or the stakes, help people act in their own self-interest. The contract helps them stay the course." Furthermore, they will work harder to avoid losing money than to achieve the benefits associated with becoming thinner (gaining something they want). "The results exemplify what behavioral economists call "prospect theory," or loss aversion. "What we know about incentives is that people work a lot harder to avoid losing $10 than they will work to gain $10," explains Ayres. "So something that's framed as a loss is really effective at changing behavior."" So this explains why the obvious benefit of Openoffice.org, freeing up money you're spending on Microsoft Office, isn't that enticing to many people. Whereas losing their comfortable Microsoft Office or WordPerfect is very painful. 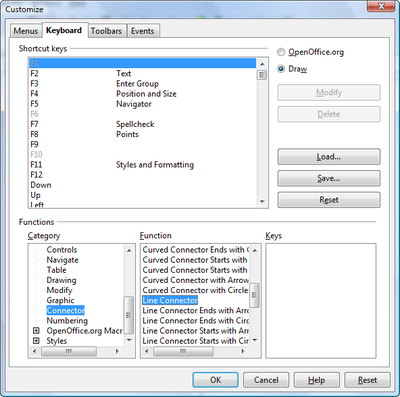 How to frame switching to OpenOffice.org in those terms? It has to be associated with losing something people love. 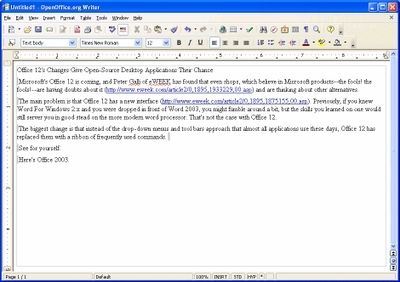 For instance, if people were going to have to choose between paying Microsoft Office and something they want more, like health benefits or their free periods (these might not be realistic examples), they might be happier to use OpenOffice.org because by doing that they avoid losing their health benefits or free periods. This sounds like heavy-handed mafia-type techniques, I realize, and I'm not trying to do that. I just think it's interesting that the pain is more intense from losing something we have than the pleasure of gaining something we could have. So I'm trying to think of ways to help people see more clearly that not only can they do what they need to in OpenOffice.org but that the money that's freed up can help them keep what they really would hate to lose. Based on this, I think that when you present the campaign to switch, it would therefore be effective to try as hard as you can to present the entire budget with all the expenses, and the entire amount of money you have, and ask the decisionmakers what they want you to cut. Don't just make it about switching office suite software. Make it about having 3x things you are currently providing and 2x money, and ask what to cut. That helps make it clearer what's really important. Are the fabulous high school music program and those two great music teachers more important than using Microsoft Office? Is that new ambulance and Chris the EMT more important than using Microsoft Office? 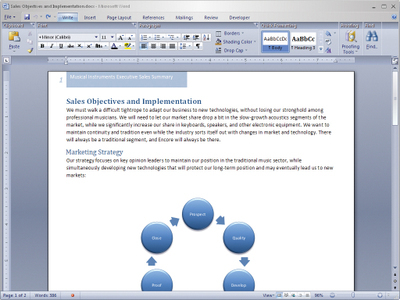 Is finishing that new product that could help you demolish your competitors more important than using Microsoft Office? 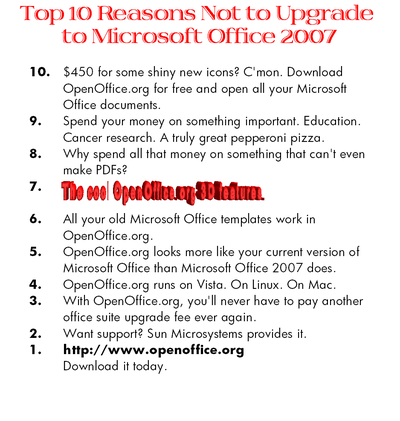 This not only helps people focus on what's really important, but helps frame the idea of switching to OpenOffice.org in terms of avoiding losing something users want, which is more effective than gaining something. Now here's the other story. People were given two placebos, supposedly for pain relief. Placebos, no effect in the chemical whatsoever. There was a back story for each placebo, and they even made fancy pens for one of them with the fake name of the placebo on the pen. One placebo, let's call it fendorexor, was a lot more expensive than the other placebo, which we'll call endorantec. When people were given the more expensive fendorexor, machines hooked up to the people indicated they experienced less pain than when they were given the less expensive endorantec. This is very interesting. It's not just reported pain, it's actual observed-by-machines pain. People's brains not only fool them into thinking that a sugar pill can reduce pain, but that the reportedly more expensive sugar pill can reduce pain more than the less expensive sugar pill. So the key benefit of OpenOffice.org can be the thing that makes people think it's not as good. Ironic, eh? I'm not quite sure what to do about this. It's hard to sell the work involved in a transition without mentioning the price. 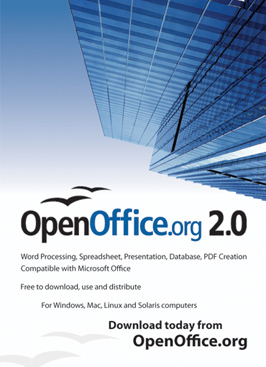 But I think it's a good idea to emphasize other aspects of OpenOffice.org, like the open document format, the availability on multiple operating systems, no licensing issues, easy availability to students at home, etc. And when you demo OpenOffice.org, do it first without mentioning the price. Or try to disguise what it is, show screen shots without the title bar. Downplay the price to users, emphasize the price with decisionmakers. 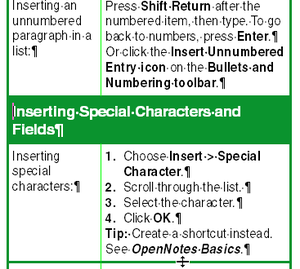 Anyone have any ideas on how to use this information to help facilitate switching to OpenOffice.org? Comments, please. I can feel it. This year is already different. In the first month of the year, I have received a far higher number of requests for training and for consulting. Also, notably, I've received several requests for input on how to, and whether to, make the transition to OpenOffice.org or StarOffice. I'm particularly pleased with the last item, since planning is essential to a successful, smooth transition to OOo or SO for your organization. If you're part of an organization that's looking at making the transition and you'd like some input from me, I'm happy--actually, eager--to give it. For February and March, I will give as many free one-hour sessions on tips for a successful transition to OOo and SO as I can fit into my schedule. I might extend this option longer, depending on response and other projects. If you're in the Denver metro area, I'm happy to come by in person. If you're outside the metro area, I can work with you on the phone, or present using the ReadyTalk multi-platform screensharing tool or your own screensharing tool. If you'd like to set up a paid in-person consulting visit of one or more days, please contact me. Here's a thought about why transitioning to OOo or SO . 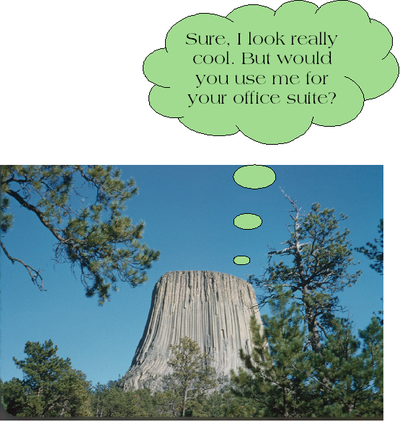 Most people have only used one office suite in their lives, maybe two. Switching to another office suite is going to be, for them, analogous to living in a small town all their lives and then making their first visit outside the country as an adult without knowing anything about what the trip will be like. It's not that the foreign country is so inherently hard to figure out, but that they've never done it before, and aren't used to all the unexpected differences. If they're mentally prepared for a change, open to the idea of learning; and have some essential tools like a guide, some good shoes, and a couple weeks of basic French; the experience will be much better. 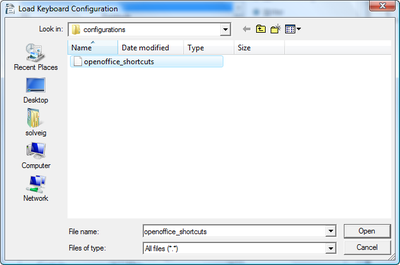 This post is for IT managers or people in similar jobs, in charge of determining whether to switch to OpenOffice.org, and then planning and implementing the conversion. 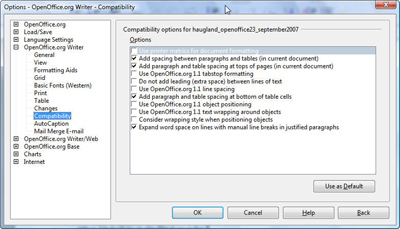 Many problems with switching to OpenOffice.org aren't, at heart, caused by actual problems with the software. There are hiccups, there are things you need to rethink, but bugs or lack of features in the software itself really aren't the issue most of the time. It's people, processes, perception, planning, and so on. Many problems can be preempted or solved with strategic use of setup options in the software. I'm going to keep this blog topic going, as I think of and have time to add more items. Please add your tips through comments. See also this post for more of a sequential planning-through-implementation checklist. See also this post for important information about how really can't trust your own judgment when determining what users need for the transition. The same post also contains a draft email of how the CEO should tell users in a direct but respectful manner that the transition is happening and no amount of complaining will do any good. Test, test, test. Before you even officially decide to switch, get a really solid representative sample of the current documents and processes that people complete with your current office suite software and database software (if you're going to be using Base) and make sure that everything essential works with OOo. Users will tell you things that aren't true. In the test phase and during implementation, don't rely on users telling you that things don't work. Research it and make sure that it doesn't work; usually the item does work or is possible, just not in the way the user is used to. 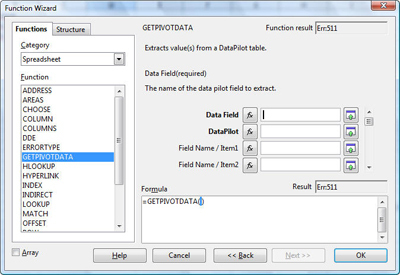 For instance, to import content into a database, you just right-click in the table area of a database window and choose Paste. Not something that you would guess. 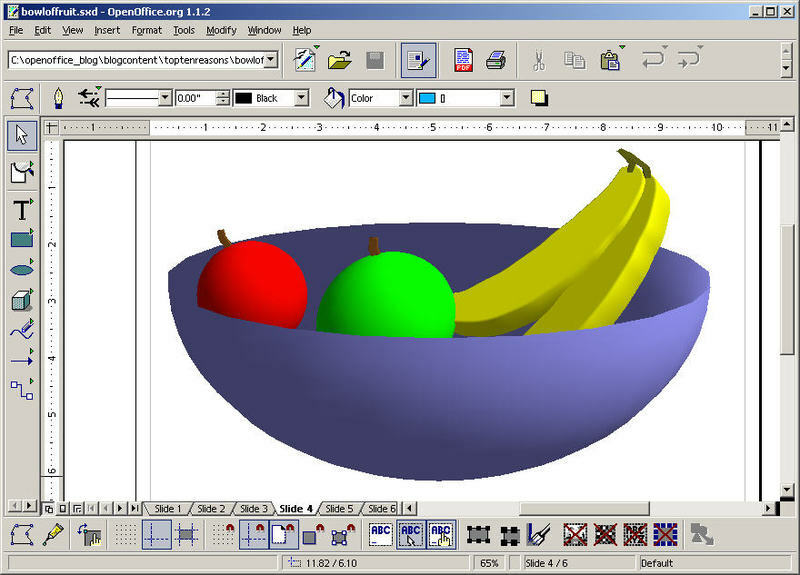 With OpenOffice.org, most things are possible; many things are not obvious. Mail merge is very different. You'll need to concentrate some effort on educating users on how to do this. It's not inherently difficult; it's just not very wizardy. Don't go live with OpenOffice.org before making sure that at least one person in every department knows how to do mail merges, including with envelopes and labels, cold. Here are all blogs that I've filed in the mail merge category. On a related note, consider using labels instead of envelopes. Unless your company pins its reputation on its ability to print addresses on envelopes, I'm pretty sure there isn't a business reason for using envelopes instead of labels. People will resist changing but, well, see the other sections of this blog for what to do about that. Both envelopes and labels are certainly possible but envelopes have a few more tricky bits, especially because of how Word users are used to using them. Here's the envelopes category of my blog. Here's the labels category of my blog. Publisher files aren't compatible with anything else. 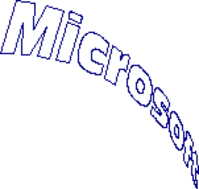 This is Microsoft's fault, not OpenOffice.org. 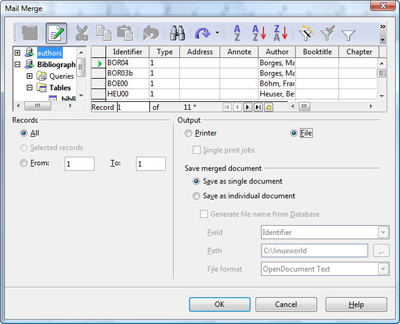 Your Publisher users will need to create new documents in Draw or Writer, depending on the type of document. You might want to keep one or two Publisher licenses around if this is a big issue. Consider creating a few commonly used templates for brochures, postcards, etc. to make the transition easier. You can make tri-fold brochures in Writer using frames. There are a lot of very nice Writer and Word templates out there; just open the Word ones in Writer and you can generally use them as is. 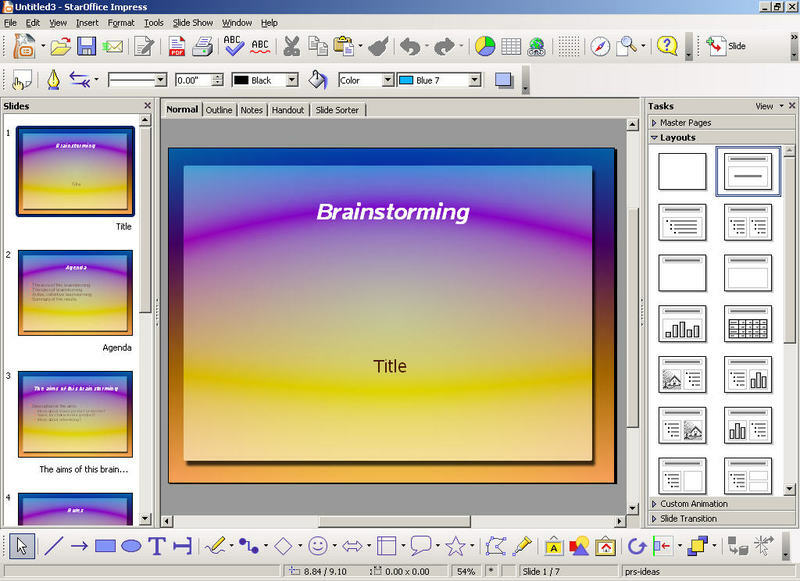 You might introduce the more advanced users to Scribus. Some former Publisher users absolutely love it. 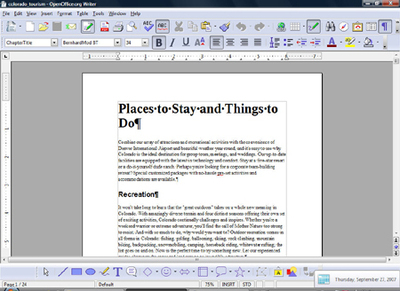 See this blog, which talks about using OpenOffice.org instead of Publisher. 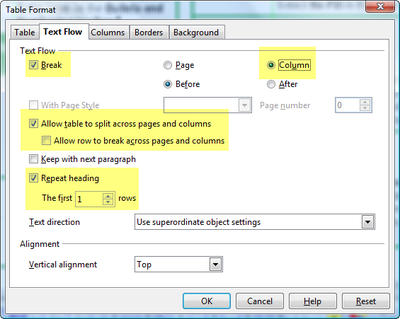 Suppressing the page number on the first page is far more complicated than it needs to be. You can train everyone, and/or you can create a template that has the first page number suppressed already. Understand what level of skills your users really have. It's often tough for an IT director to realize that many users have really core skills and aren't able to easily navigate up and down in an Open window; don't know to select first then format; don't know that there's a keyboard shortcut available instead of copying and pasting; etc. Knowing your users' skill level will help you plan training. This post covers this in more detail. See this post at the end for a draft email of how the CEO should tell users in a direct but respectful manner that the transition is happening and no amount of complaining will do any good. Find the vocal people who don't like the software, and convert them. 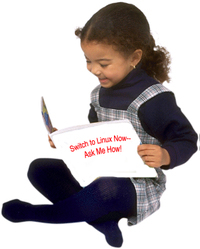 Show them the cool things they can do with the software. Tell them you value their experience with the previous software and would really appreciate their insight into how best to do tasks in the new software. Alternately, if they're a tough case, then it's time for their manager to get tough and tell them that using OpenOffice.org, and learning it, is now part of their job description. 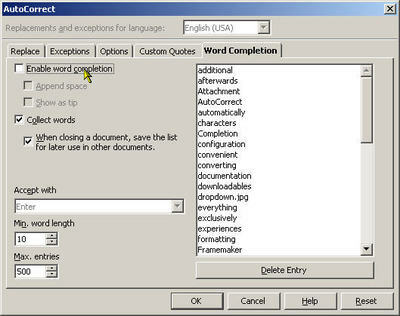 Many people will tell you that things are so much easier in Word. This is not necessarily true. If you can, then politely ask the person telling you this to demonstrate the supposedly easier process in Word, preferably in front of a decision-maker or other higher-up. Also see above regarding users telling you that things don't work. You might need to keep a few Excel licenses around if your financial people are addicted to macros or wield extraordinary power. This is OK. There will be a period of unpleasantness. 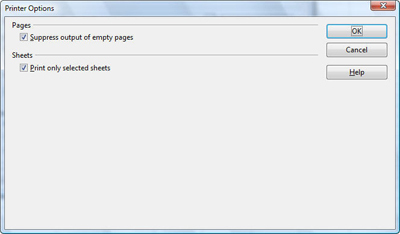 When you switch to OpenOffice.org, many of your users will be unhappy at first. Change is never popular, especially if you have WordPerfect users who have not had to change word processors since the 90s. You will need to tell a lot of people that yes, it is more complicated in OpenOffice.org to do X or Y, and that they'll just have to deal with it. Having support from higher-ups will help this go over, if not better, then at least with more effect. Remind people that their job descriptions do not include the right to use only Microsoft Office or WordPerfect, or at least that their job descriptions include the phrase "Other duties as assigned." Make sure everyone knows that free doesn't mean bad. It's not easy to explain, but talk to users about how OpenOffice.org is not about making money; it's about people working together to get the features they need, and sharing them with others. Also, many people will think that your organization is just being cheap by refusing to spend money on software. You of course are trying to save money, at least that's a common goal, but reinforce that you now can spend money on things that are more important like benefits, smaller class sizes, or whatever is more important in your organization. Don't teach them to fish if it's easier to give them reusable fish. Spend some time getting to know what you can do with templates and styles. 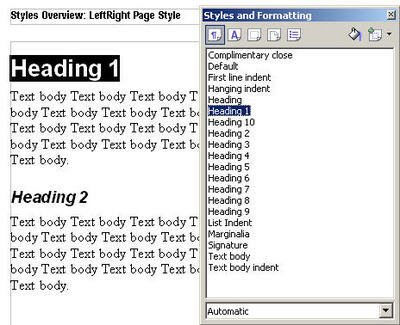 Much of the formatting you can do is possible, but challenging for users who only have core skills. For instance, a common formatting feature is a left-hanging indent. Users might not be able to do this easily. Another item is text that is indented from both the left and right an inch or so. You could create styles with this formatting, call them OurOrg_HangingIndent and OurOrg_LeftRightIndent, for instance, and add them to a template that everyone can access. Here's a template with those two styles. 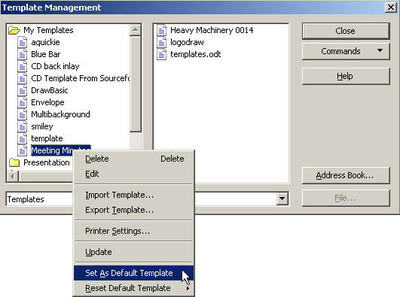 In particular, consider setting the default template for each user. Incorporate all styles that they might need, such as the ones I mentioned in the above paragraph, plus a page style that has no page number on the first page, and automatically uses a page number on the second page. 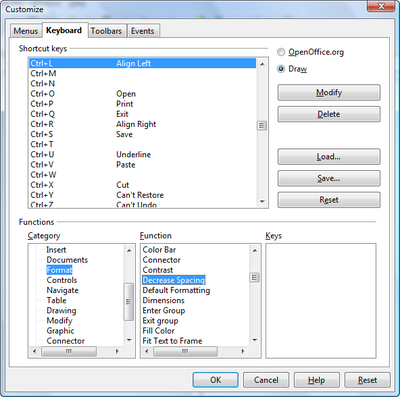 Customize menus and toolbars Consider customizing the menus and toolbar. If you get a lot of calls from users looking for page setup under File > Page Setup, it might be easier for you to just add that option under the File menu rather than telling everyone several times that it's under the Format menu. 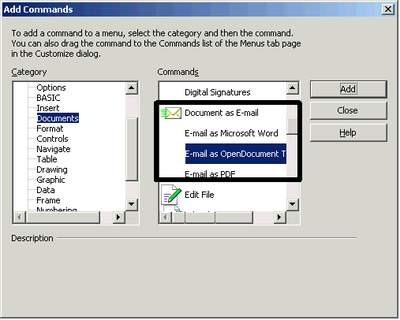 Or create a new menu called Month-End Procedures that will open various windows users need to use for month-end procedures. Along the same topic, consider removing some icons that might be confusing or lead users to try things you don't want them using. My 89-year-old father, not computer savvy, uses Calc to track financial information for taxes. I made it easier for him by taking off most of the icons. 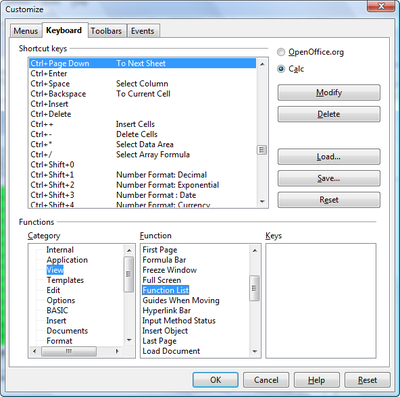 Here's some info on how to customize toolbars and menus. 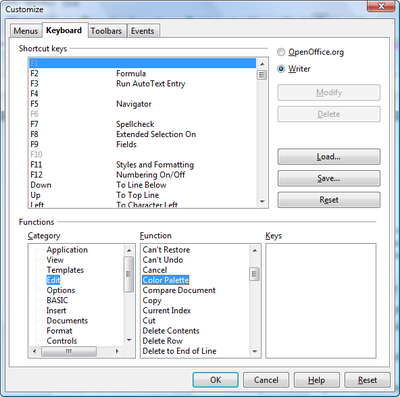 Create keyboard shortcuts for tasks and for styles Set up keyboard shortcuts for people, or show them how to do it themselves. This will help especially with WordPerfect users who have memorized the keyboard shortcuts and find it difficult or slow to switch to a new program. If it takes three mouse clicks to get to the feature on the mouse, someone who's been getting there with Ctrl G is going to be annoyed even though it really isn't that much work to do the menu selection. (Again, as I said at the beginning, it's not about the software causing problems.) So show them how to use Tools > Customize, Keyboard to set keyboard shortcuts. My blog on that topic is here. 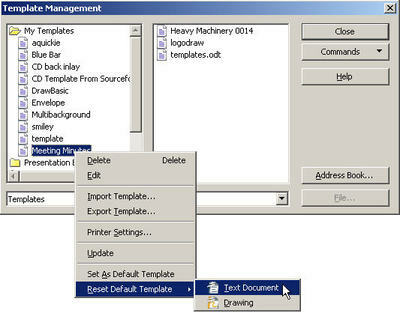 Set up menu items to bring up templates or other documents. For instance, you might make a new menu called Personnel Department Templates and add items like Job Description Template, Org Chart Template, and so on. A blog on how to do this is forthcoming; I've got the macro but haven't fiddled with how to do it. Add fun and convenience with the picture Gallery. Some users find it difficult to navigate a file system to find clip art or pictures to include in their documents. 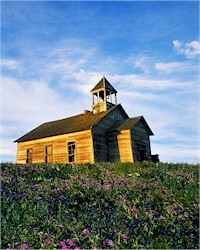 In addition, pictures are just fun and can help change attitudes surprisingly quickly. I highly recommend configuring the Gallery so that there are vast numbers of graphics available. Users can simply choose Tools > Gallery, select a category, then drag a picture into their document. My blog on adding graphics to the Gallery is here. Show everyone PDF and the File > Send features. It's a very slick easy feature, people like it, and it's great for reducing issues you encounter when working with people who use Microsoft Office or other office suites. Show advanced users the automatic TOC feature. So many people still manually type their tables of contents. Agh! Just be sure that you've used the paragraph styles Heading1 through Heading 10 (or as detailed as you need, maybe Heading3) on the appropriate headings. Then Insert > Indexes and Tables > Indexes and Tables, and click OK. Bam, instant TOC . You can also make a linked one and the links remain when you export to PDF. 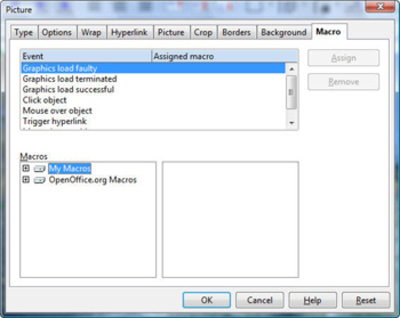 Any links that you create in any way in the OpenOffice.org document will remain when you export to PDF. 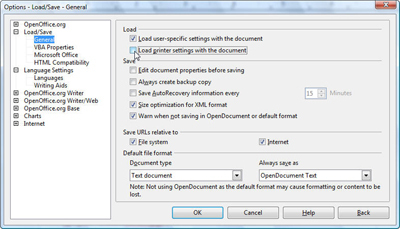 Just be sure to choose File > Export as PDF, and in the first tab of the PDF options window, be sure that Tagged PDF is selected. Here's the PDF/Publishing blog, including how to make the linked TOC. Advanced users or web people will love this. Test, pilot, rinse and repeat. You absolutely must do a long research process. Test documents. You might discover that several departments are using Quattro Pro and have documents created in the 80s. 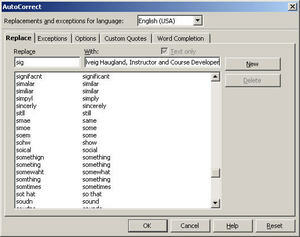 Be sure OpenOffice.org can open these and if it can't, then have a plan for outsourcing re-creating them. (Before you do that, be sure that these documents even need to be conveted in the first place.) 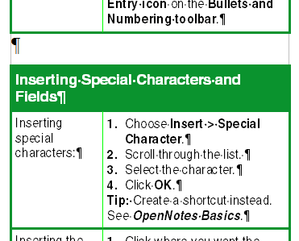 If your company uses an app that produces a spreadsheet or CSV file, be sure that OpenOffice.org can open it. Talk to every department and give them an exhaustive list of questions. Make sure they know that it is crucial they give you complete and accurate information. Trust, but verify. With emphasis on the verify part. Create a plan, publish the plan, and stick to it. 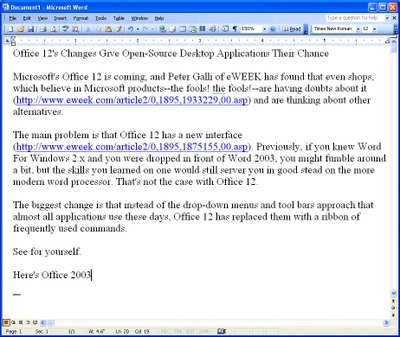 Give people a transition time when they can learn and start using OpenOffice.org, and a cutoff time when you take MS Office or WordPerfect off their machines. For you and your IT group, of course, you have a public cutoff date and an internal cutoff date maybe 1-4 months later, to give yourselves some flexibility. 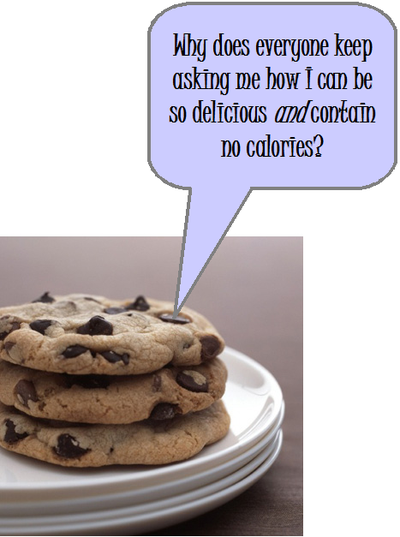 I couldn't find this article when I searched my blog, so I'm resposting this "classic" blog ;>. 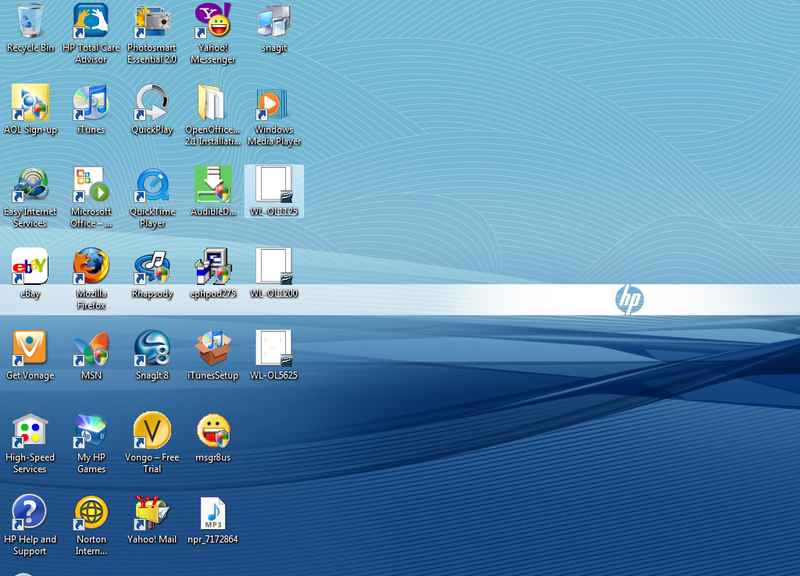 It's actually a techtarget article I wrote on how to customize toolbars and menus. Not only is reconfiguring the interface easy, and not only does it help people use OpenOffice.org and get used to the new program, but it is huge fun to change things around this much. Check it out! Erwin sums up an EU report on OpenOffice.org/StarOffice. Read another story about spending money on something more important than office suite software. This was posted in April but somehow I missed it. "Bacone College in Muskogee, Oklahoma, is an outreach of the American Baptist Association (ABA) to Native Americans, and is Oklahoma's oldest center for higher education, established in 1880. The small, four-year liberal arts school doesn't receive any form of government funding, so finding economical ways to provide the best education possible is a priority for the staff. Recently, Bacone's technologist Robert Duncan III, transferred a Linux hobby into huge savings for the school's IT department. " "Duncan remains pleased with the results of his creativity. "This puts us in control of our tech resources, instead of relying on some third party. It's kind of a scary to say there's some company out there telling me I'm going to buy a new computer every two years. We've doubled the number of computers we have available to us with the cost-savings of OpenOffice.org versus Microsoft Office. We've made available open access to labs and cyber cafés using hardware that others would have just thrown away. "